This data set provides images of boreal forests in central Canada collected over numerous tower and auxiliary sites during the BOREAS Intensive Field Campaigns (IFCs) in the Northern (NSA) and Southern Study Areas (SSA). 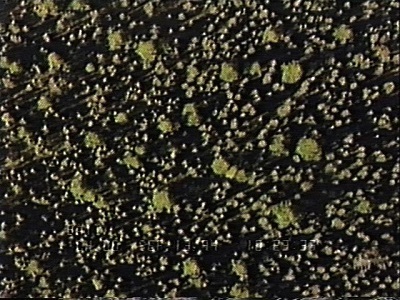 The images were acquired by helicopter with VHS video cameras during the green-up, peak, and senescent stages of the growing season from May-September of 1994. These snapshots were generated from VHS imagery and converted to .jpg format. There are 163 images in .jpg format with this data set. Figure 1. Image of an Aspen auxiliary site in the BOREAS Southern Study Area (SSA). The image was taken September 9th, 1994. This data set provides images of boreal forests in central Canada collected over numerous tower and auxiliary sites during the BOREAS campaign in the Northern (NSA) and Southern Study Areas (SSA). The images were acquired in all three Intensive Field Campaigns (IFCs) during the green-up, peak, and senescent stages of the growing season from May-September of 1994. 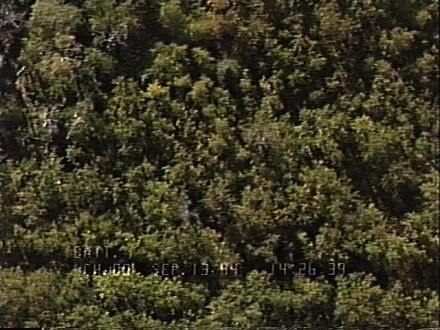 The BOREAS Remote Sensing Science (RSS)-RSS-03 team collected the images with two VHS video cameras mounted on a helicopter platform, and video single-frame "snapshots" were processed to the still images. 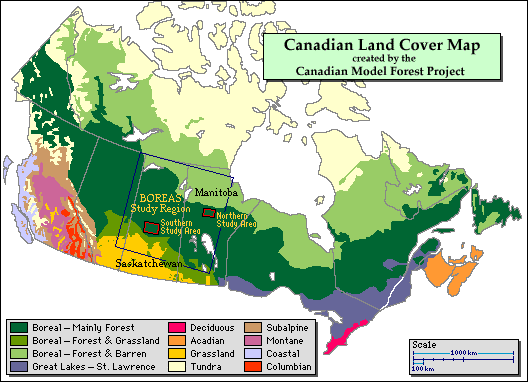 The Boreal Ecosystem-Atmosphere Study was a large-scale international interdisciplinary experiment in the boreal forests of central Canada. Its focus was improving our understanding of the exchanges of radiative energy, sensible heat, water, CO2 and trace gases between the boreal forest and the lower atmosphere. A primary objective of BOREAS was to collect the data needed to improve computer simulation models of the important processes controlling these exchanges so that scientists can anticipate the effects of global change, principally altered temperature and precipitation patterns, on the biome. Spatial Coverage: Central Canada, in the BOREAS Northern (NSA) and Southern Study Areas (SSA). The NSA is is west of Thompson, Manitoba. The SSA is north of Prince Albert, Saskatchewan. Spatial Resolution: The spatial resolution for the imagery was somewhat variable based on the altitude of the helicopter, tree height, and ground cover. Helicopter altitude was usually 300-m above ground level. There are 163 images in .jpg format with this data set. The files are named according to the date, study area, and site. Photo from May 31, 1994 from the ssa (Southern Study Area), ojp (Old Jack Pine), fluxtower 1. Table 1. The helicopter visited all of the NSA and SSA tower and category-1 auxiliary sites. Each site listed below was observed at least once during the 1994 campaign. The coordinates in the table are based on the North American Datum of 1983 (NAD83). The imagery was taken to capture visual conditions at the site during data collection that could then later be referred to as necessary when processing the data to aid in quality assessment. The imagery was taken from the helicopter platform simultaneous with radiometric ground measurements and sunphotometer measurements from the same platform. The camera field of view is unknown. BOREAS Information System (BORIS) staff viewed some of the JPEG imagery to verify data format. 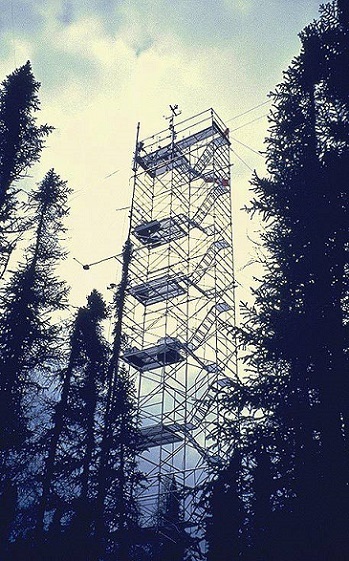 BOREAS was a large-scale international interdisciplinary experiment in the boreal forests of central Canada. Images were collected from two helicopter video cameras of numerous flux tower and auxiliary sites (some of these sites were located within the tower sites) during the BOREAS campaign in the NSA and SSA (Sellers et al., 1995). The data were collected during the green-up, peak, and senescent stages of the growing season. Observations were made during all three BOREAS 1994 IFCs from May to September of 1994. Figure 2. Map showing the BOREAS study areas in central Canada. Video imagery was taken with color VHS video cameras mounted on a helicopter platform at BOREAS sites simultaneous with radiometric ground measurements and sunphotometer measurements from the same platform. The video cameras were operated continuously during data collection. The still frames were digitized from the video tapes as representative views of the sites. Figure 3. The image on the left was taken from the helicopter over the SSA Old Black Spruce Site (OBS) flux tower site September 13, 1994. The right image is the fluxtower at the SSA OBS site. The instrumentation used was designed and developed at the National Aeronautics and Space Administration (NASA) Goddard Space Flight Center (GSFC). In general, the helicopter was flown during relatively clear days when possible. Data collection was attempted during conditions of highest possible solar elevation (Walthall et al., 1996). Two video cameras were used in the system. One video camera was bore-sighted with the main instruments on the pointable platform, and the other was next to the 70-mm photographic camera set to view nadir only. All observations were usually at 300-m above ground level (AGL). During IFC-1, a video camera with an operator-controlled electronic zoom and focus system was used. During IFC-2 and IFC-3, this lens was replaced with the same type of lens used with the nadir-looking camera. These lenses had a manual focus and a 20- to 80-mm zoom range, which was set at 30 to 35 mm. Multiple observations were captured from the video at sites where the cover changed significantly during the scan time; this was determined subjectively by the operator (Walthall et al., 1996). The spatial resolution for the imagery was somewhat variable based on the altitude of the helicopter, tree height, and ground cover. Helicopter altitude was usually 300-m above ground level. The video snapshots were generated on a Power Macintosh PC 8500/220 using a VHS video player and Avid VideoShop 3.0.2. The images were then converted from PICT format to JPEG for universal accessibility. Sellers P., F. Hall, H. Margolis, B. Kelly, D. Baldocchi, G. den Hartog, J. Cihlar, M.G. Ryan, B. Goodison, P. Crill, K.J. Ranson, D. Lettenmaier, and D.E. Wickland. 1995. The boreal ecosystem-atmosphere study (BOREAS): an overview and early results from the 1994 field year. Bulletin of the American Meteorological Society. 76(9):1549-1577. Walthall, C., D.L. Williams, B. Markham, J. Kalshoven, and R. Nelson. 1996. Development and present configuration of the NASA GSFC/WFF helicopter-based remote sensing system. International Geosciences and Remote Sensing Symposium (IGARSS) Spring 1996, Lincoln, Nebraska.